In a recent trip home, I was surprised to discover, that my (once young) nieces and nephews were now unmistakably entering adolescence. An exciting but scary time for everyone. They were typical teenagers, and the only time they answered my questions was if I texted them – geez! Their parents, however, are not that tech savvy and don’t realize what an online presence each of them have with facebook, twitter, and email. Parents – do you know what your kids are doing online? Social Media has changed the way teens relate to each other. You now not only have the opportunity to meet people in person who are in your physical environment, you can make hundreds of friends online. Suddenly, Facebook has become a role-model for these teenagers. Teens reference their sexual adventures, their experiments with alcohol and other drugs, and the parties that they throw while their parents are away on facebook and it is viewed as cool by his or her peers. Teens using these platforms are not at a developmental stage to realize the potential negative impact that their posts could have in the future. Things are never fully erased from the internet. It provides a platform for cyberbullying. There is some evidence that children who are victims of cyberbullying suffer longer from psychological distress. There is a sense of helplessness because often the perpetrator is unknown. As well, it often happens at home which should be a place of safety. The average Canadian child watches nearly 14 hours of television each week. By his or her high school graduation, the average teen will have spent more time watching television than in the classroom. The average child sees 12,000 violent acts in television annually. Giving the message the violence is an appropriate way to deal with conflict. Children who have a lot of screen time are less physically fit and more likely to eat high fat and high energy snack foods. There is convincing evidence that alcohol and tobacco advertising increases its consumption. Teens see 1000 to 2000 beer commercials annually. What steps can we take to protect our kids? We should use media with our children. Use it as an educational tool. Help children differentiate fantasy from reality and analyze media critically. Parents should control children’s media access – relying on filters is not enough. Computers and TV’s should be in central areas only (not in a child’s own room). Remember, that a phone with data is equivalent to a mini-computer. Screen time needs to be limited to <1-2 hours a day. 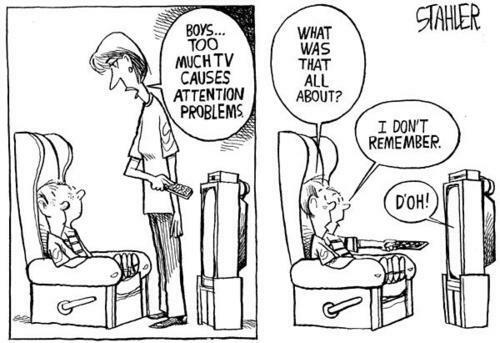 No screen time for children < 2 years of age. Advocate for better quality programming, for better ratings on video games, for media education curriculums at schools. Overall, the internet is a very powerful tool. It affords us a near limitless information source and it is a great communication tool. But adolescents must be taught to use social media, TV, and video games in the safest manner possible.